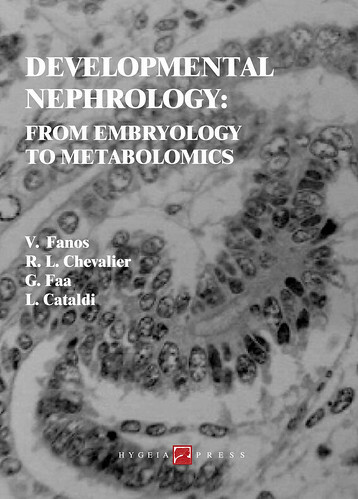 You can buy “Developmental Nephrology: From Embryology to Metabolomics” on many Italian online bookstores, in particular on Amazon, IBS and Goodbook. For more information about this book, please send us an email at hygeiapress@hygeiapress.com. The traditional approach to kidney disorders is changing. In the field of diagnostics much innovative research is ongoing: from the “old” embryology, revisited and re-interpreted with new eyes in the light of immunohistochemistry, up to metabolomics the latest “daughter” of genomics, the most promising and remarkable of the “omics” disciplines. Between these two extremes we find a universe of novelties, ranging from the most recent urinary biomarkers to the questions of nutrition and growth, as well as those of ethics, which the new populations of extremely low birth weight (ELBW) neonates present to neonatologists and nephrologists. The studies on perinatal programming expand the temporal horizon of precocious reduction in the number of nephrons, both congenital and/or acquired, thus dilating and multiplying the immediate and long-term negative effects. Neonatal asphyxia, obstructive uropathies, nephrotoxic drugs administered to the mother and/or to the neonate, malnutrition, underfeeding, or overfeeding make it necessary to apply all possible preventive measures to ensure the well-being of the kidney. Because of the kidney’s holistic dimension, the methodical and rigorous study of neonatal nephrology has advanced all aspects of health through the life cycle. This volume is an update state of the art of the latest discoveries in neonatal and pediatric nephrology. These advances will have an even greater impact when the same children reach adulthood, and the ultimate consequences of perinatal care are unmasked. You can also view the book’s table of contents here: link.